And they called it bunny love! 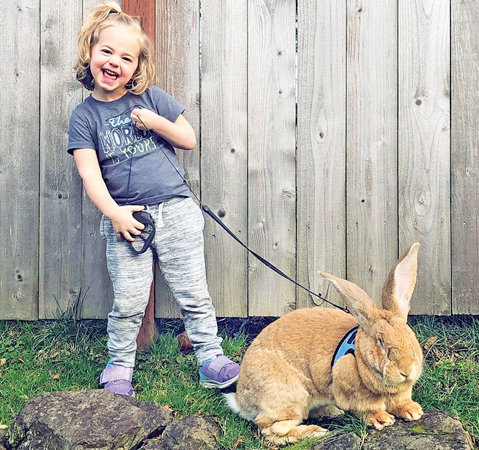 This little girl is best friends with a huge rabbit. Stay-at-home mum Lindsay Koelling bought fluffy brown Continental Giant rabbit – named Cocoa Puff – in 2017 as a gift for daughter Macy’s second birthday. But the big bunny has since grown so huge his monthly food bill is £200 and he needs a litter tray 10 times the size a normal rabbit would. Mum-of-two Lindsay said her gargantuan pet is almost the same size as Macy, now three, and the adorable duo have become inseparable since they first met, playing with toys, watching TV and playing in the garden together. Despite the most eye-catching aspect of Cocoa being his size, he is actually small for his breed. The online sensation has since racked up thousands of online fans for his hilarious pictures and videos, which show him appearing to dwarf his young companions. Lindsay added: “Cocoa Puff is actually small for his breed, we were hoping he would be about 5lbs heavier.